This spring, K Contemporary and Sugar Cube are proud to present Sarah Winkler’s newest body of work in an exhibition titled “Monumental Duality”. This solo exhibition of large-scale paintings made with crushed minerals, explores and reveals the essential nature of the western landscape both above and below ground. Winkler works with a signature set of abstracted textures based on fifteen naturally occurring patterns in nature. She takes these patterns of formation and erosion and applies them to her imaginary geological constructs that lift upward and plunge downward from implied horizon lines. Her mountainous and desert landscapes seem at immediately familiar, yet have no fixed GPS location. Proposing that an alternative geological narrative has occurred, Winkler plays off the knowledge that the Earth is not a static place, and that ancient landscapes arrived through a series of unexpected cataclysmic events. Elements of experimentation, unpredictability, chance and discovery are common components in this artist’s approach to her work. Each dramatic painting is built upon solid strata of creative insight and intimate familiarity with the geology of its monumental subject. Winkler also employs a spatial painting technique called "equivocal space", which alters depth perception through color, composition and media to keep the eye engaged and journeying around the image. “It is a way that conveys how we move in time through actual landscapes,” Winkler says. 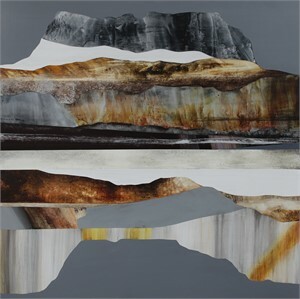 In all her work, this artist explores geology as the essence of creation and keeper of combined histories. “My works have a traditional subject matter – landscapes – but they’re executed in a labor-intensive and unconventional manner with a nod to the past and a vision of what’s next”. Sarah Winkler was born in Manchester, England, has lived in Malawi, Africa and Brunei, Borneo before emigrating to the US. She currently lives and works in Morrison, Colorado. Winkler studied Art and Earth Science at William Paterson University and combines both subjects in her landscape and environmental artworks. She has exhibited nationally since 2004 and was recently showcased at the LA Art Fair and Art Aspen in 2018 coinciding with a major solo show "Luminous Mountainous" in Denver at K Contemporary. In 2019, Winkler was honored to be selected by US Ambassador, John Pommersheim and the curators of the highly regarded Art in Embassies program to participate in an upcoming 3 year cultural visual diplomacy exhibition at the US Ambassador’s residence in Dushanbe, Tajikistan, sister city to Boulder, Colorado. 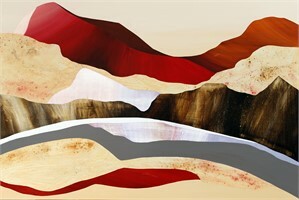 Her commissioned artworks are featured in many prominent private, public and corporate collections including Chevron, San Francisco General Hospital, The Phoenician, Mountain Shadows Resort, Hilton, Hyatt, Marriott, The Cosmopolitan Hotel of Las Vegas, Viceroy, Ritz Carlton, Montage, Empire Pass, Deer Valley Resort. They have also appeared in publications such as Scientific American, Dwell, Alpine Modern, Western Art and Architecture, Mountain Living, CREATE! and New American Paintings. This spring, K Contemporary and Sugar Cube are proud to present Sarah Winkler’s newest body of work in an exhibition titled “Monumental Duality”. This solo exhibition of large-scale paintings made with crushed minerals, explores and reveals the essential nature of the western landscape both above and below ground. Winkler works with a signature set of abstracted textures based on fifteen naturally occurring patterns in nature. She takes these patterns of formation and erosion and applies them to her imaginary geological constructs that lift upward and plunge downward from implied horizon lines. Her mountainous and desert landscapes seem at immediately familiar, yet have no fixed GPS location. Proposing that an alternative geological narrative has occurred, Winkler plays off the knowledge that the Earth is not a static place, and that ancient landscapes arrived through a series of unexpected cataclysmic events. Elements of experimentation, unpredictability, chance and discovery are common components in this artist’s approach to her work. Each dramatic painting is built upon solid strata of creative insight and intimate familiarity with the geology of its monumental subject. 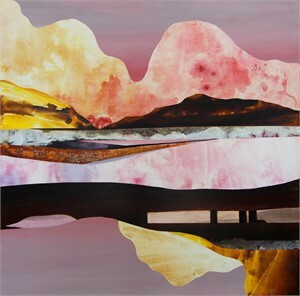 Winkler also employs a spatial painting technique called "equivocal space", which alters depth perception through color, composition and media to keep the eye engaged and journeying around the image. “It is a way that conveys how we move in time through actual landscapes,” Winkler says. 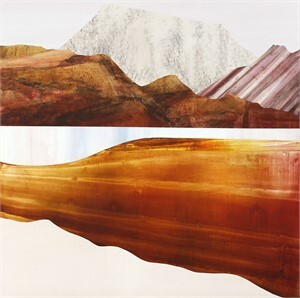 In all her work, this artist explores geology as the essence of creation and keeper of combined histories. “My works have a traditional subject matter – landscapes – but they’re executed in a labor-intensive and unconventional manner with a nod to the past and a vision of what’s next”. Sarah Winkler was born in Manchester, England, has lived in Malawi, Africa and Brunei, Borneo before emigrating to the US. She currently lives and works in Morrison, Colorado. Winkler studied Art and Earth Science at William Paterson University and combines both subjects in her landscape and environmental artworks. 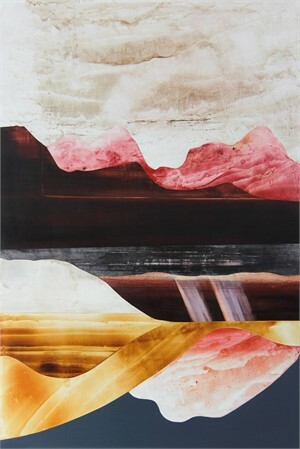 She has exhibited nationally since 2004 and was recently showcased at the LA Art Fair and Art Aspen in 2018 coinciding with a major solo show "Luminous Mountainous" in Denver at K Contemporary. In 2019, Winkler was honored to be selected by US Ambassador, John Pommersheim and the curators of the highly regarded Art in Embassies program to participate in an upcoming 3 year cultural visual diplomacy exhibition at the US Ambassador’s residence in Dushanbe, Tajikistan, sister city to Boulder, Colorado. 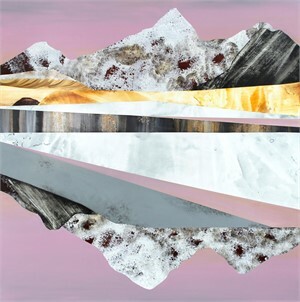 Her commissioned artworks are featured in many prominent private, public and corporate collections including Chevron, San Francisco General Hospital, The Phoenician, Mountain Shadows Resort, Hilton, Hyatt, Marriott, The Cosmopolitan Hotel of Las Vegas, Viceroy, Ritz Carlton, Montage, Empire Pass, Deer Valley Resort. They have also appeared in publications such as Scientific American, Dwell, Alpine Modern, Western Art and Architecture, Mountain Living, CREATE! and New American Paintings.